I have carried these letters around with me for over a decade in my notebooks. I share them for posterity sake. Here are a few lines on five important issues that must be clear in the beginning, and I hope to arrive right in the wake of this letter. From thee the truth will not stay hidden. When He Himself is not the guider." We therefore recognize the significance of Frater Albertus' calling: He had been chosen to point towards that source, which all present systems of learning avoid and even deny. But because his students had been adherents of these systems he did not dare speak openly and directly, resorted to all kinds of games and foremostly, to blandishments. Such persons can neither receive nor recognize truth and are full of their own ideas; they used the study groups as sounding boards for these pseudo-esoteric beliefs. This includes all, without one single exception who ever were paid employees or executives at Paralab: That was Paralab's purpose, a deselector to weed out the unfit. Second, the purpose why I mention Amo is that he not only gives the source, even with name, but is Frater Albertus', and consequently our connecting link thereto. A further detail is important because it fortifies that link. It also lets you see the neurotic reactions of the unfit who know nothing and let their phantasies imagine all sorts of things. Third, Frater Albertus had taught three groups, or circles of students: The first circle was taught individually and may include a few of his peers; the second circle was the Paracelsus Research Society, and the third circle was the Paracelsus College, with which latter he approached the outside world. Two pupils of the first group were accepted for further studies in centers in northern India (Pakistan) and are not available at present. The second group must provide conscious assistants, above all to those of the third group who would have to be in charge of projects in the world. Fourth, somebody may say "how come you know this; he (Fr. A) told me differently." To which I must reply that of all of Fr. A's students I have attended the largest number of advanced classes, including the three crucial septa study groups of 1977, 1980, and the elective 1981, which was for former P. R. S. students conducted as the final septa study group. I am also one of his oldest students in association, and I have been his laboratory Engineer and Designer for sixteen years. This certainly does give my word some weight, and I can prove my statements through knowledge and experience. As an example for the latter, I must mention that most of Frater Albertus' laboratory equipment is worthless. There are no furnaces (gas burners and stoves are not furnaces). It is chemist's equipment and was used in classes to point towards an operation, resp. illustrate it without revealing the arcanum of the operation. A soxhlet extractor, e.g., illustrates the operation of extraction, and a gas burner setup may illustrate the operations of calcination, or making antimony glass. But that is not how an alchemist proceeds. That's how they show it in the movies. Their are no soxhlets in an alchemist's lab. A further example would be a naturalist's preference of grain over synthetic alcohol, as he had been set, in his pseudo-esoteric training, on the "natural is better than synthetic" hobby-horse. It takes considerable alchemical insight to know that for most spagyric and alchemical purposes, as herbal tinctures, menstruums, and alcahests, the high-purity, reagent grade synthetic alcohol is by far the preferable. For herbal tinctures it can be taken right from the bottle - grain alcohol should not be used on herbs. Fifth, there is the notion that an alchemist must not make gold in order to make a living. That's not quite correct; an alchemist, and even the artist who is not yet an alchemist, after he has been chosen and commisioned (in the case of an alchemist, also ordained), must first of all strive to get out of the rut of this world, and preferably so by "turning lead into gold" Bish�m Adunn� Y�ishue Nazr�ya - In the Name of Our Lord Jesus of Nazareth. After an apprentice has demonstrated his disinterest in the riches and pleasures of this world, and has been chosen and commissioned, he must first of all strive TO MAKE GOLD or other precious metals for a living, and for the relief of the sick and poor. At least, that is the case for the first and second group (the P. R. S.) students, who must stand back and not become involved in worldly affairs. If the same was explained to Paracelsus College students, I do not know. As I already said on the phone, what Frater Albertus taught in the classes is nothing exceptional. Much of it was in the historical notes of my high school chemistry book. My chemistry teacher, a Dr. Karl Bernius, happened to be an accomplished alchemist who had made the philosophical mercury and used these historical notes and lecured us on subjects as Dr. Becker's "Das Aceton." He was already in his eighties, had special permission not to retire and looked like sixty. He could outpace us on excursions. He would never have died of natural causes and was run over by a car when his time had come. The renowned West German chemical and pharmaceutical firm of Bayer Leverkusen, where I was a research executive for many years also had their alchemists. Indeed, Dr. Bayer, descendant of the firms founder, distinguished professor of chemistry, director of research and member of the board of directors was an artist and alchemist himself and had given orders that any newly discovered colored substance be studied for its pharmacological properties. These chemist-alchemists had duplicated much of Paracelsus' and Basil's work and had found that their remedies were, indeed, mildly effective. They also knew the theory; that the virtue is in the sulphur resp. soul, which gives the tinge. Therefore, color might be the sign of some curative agent. On this heuristic basis had been discovered quite a many of the firms pharmaceuticals. Similarly did Dr. Guenther Goldschmidt conduct extensive historical-theoretical and laboratory research in alchemy at the Swiss pharmaceutical firm of Ciba-Geigy in the thirties, the results of which he published in 1938. It cannot be ruled out that Frater Albertus had developed a detuned version of Dr. Goldschmidt's laboratory procedures for his class teaching, as he had been in continuous contact with Ciba-Geigy, and had received research and teaching grants from them. 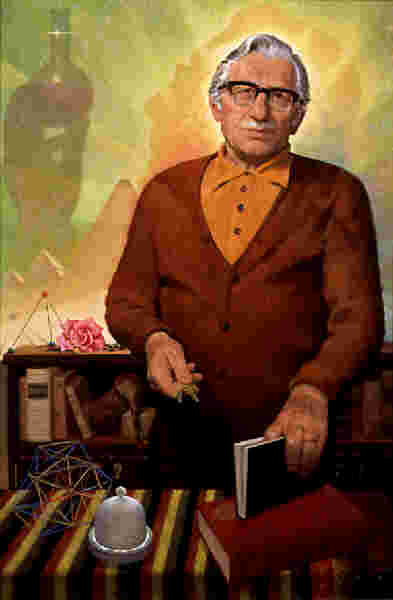 Dr. Goldschmidt may have originated the adaptation of modern lab glassware to alchemical procedures. So the pharmaceutical firms are very knowledgable. I can only pity those who have attended Frater Albertus' study groups, and/or read a few books, and then dabble about in a makeshift laboratory. There's even the one or the other here in Salt Lake City as you may know. Certainly are some of these tinctures mildly beneficial, but they do not render themselves well to cost-effective and continuous manufacturing processes and the pharmaceutical firms have thus decided not to put them on the market as that would become much too expensive.